“Missing mass” in the universe has many types and forms. New research relates not to dark matter but a new way to detect baryonic matter (i.e. all normal matter) that exists in an unusual form as filaments. Arxiv – Most of the baryons in the Universe are thought to be contained within filaments of galaxies, but as yet, no single study has published the observed properties of a large sample of known filaments to determine typical physical characteristics such as temperature and electron density. 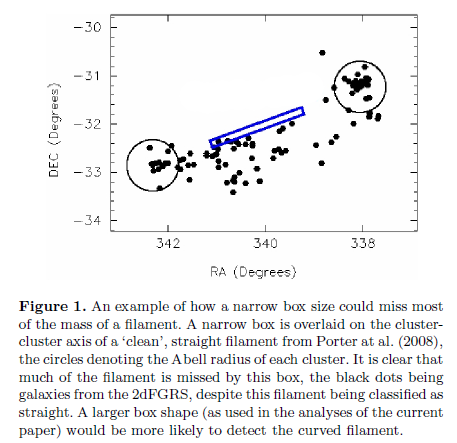 This paper presents a comprehensive large-scale search conducted for X-ray emission from a population of 41 bona fide filaments of galaxies to determine their X-ray flux and electron density. The sample is generated from Pimbblet et al.’s (2004) filament catalogue, which is in turn sourced from the 2 degree Field Galaxy Redshift Survey (2dFGRS). Since the filaments are expected to be very faint and of very low density, we used stacked ROSAT All-Sky Survey data. We detect a net surface brightness from our sample of filaments of (1.6±0.1)× 10^−14 erg cm^−2 s^−1 arcmin−2 in the 0.9–1.3 keV energy band for 1 keV plasma, which implies an electron density. Finally, we examine if a filament’s membership to a supercluster leads to an enhanced electron density as reported by Kull and Bohringer (1999). We suggest it remains unclear if supercluster membership causes such an enhancement. Astrophysicists also predicted that the mass would be low in density, but high in temperature – approximately one million degrees Celsius. The matter should have been observable at X-ray wavelengths and now it has been observed. Bregman (2007) notes that the observable fraction of the WHIM we seek to detect (i.e. T = 1 million to 10 million degrees kelvin) should have an overdensity of 10 to one thousand, which is below current detection thresholds. Hence, our failure to detect individual filaments of galaxies using current methods is not in conflict with model predictions. In summary, we have detected a soft X-ray emission from the combined sample of 41 filaments with known positions using the Pimbblet et al. (2004) filament catalogue.